So it looks like Monday things will start to stir up once again in the whole Radiohead The King of Limbs conspiracies. It has been leaked out early that there will be a Newspaper titled "The Universal Sigh" which will be given away for free on Monday in certain major cities throughout the world. 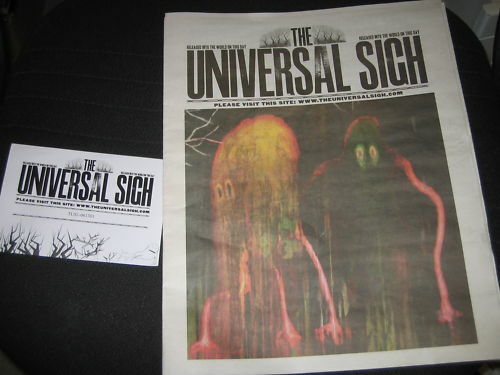 Here is the description from the Ebay ad "This is a copy of the Universal Sigh promo newspaper given by Radiohead to promote their The King Of Limbs. Along with this you will be given a coupon with a unique code and what you can do with it. Standard tabloid size, 12 pages, this will be sent folded in half." It all kind of makes you think that the codes will unlock something.....say a website or a link to some additional song downloads, or maybe just pictures and more clues. The nice thing about all of this though is the fact that on Monday we might actually get to hear from the band and get a little bit more details in these 12 pages. Don't blow your mind with why"